Every time you write a press release for you pr clients, you need to make sure you already have a media list formulated. A mistake is to send each release to every media on your Rolodex listing. That doesn’t help get your company or pr client noticed. By targeting specific writers or reporters with your press releases, or articles can better improve your chances to get published. If you are doing your own publicity in-house, then be sure that your database of reporters is current. Media people move around a lot and having a current roster of names that match the media is good practice, and it will reduce embarrassing follow-ups. It is worth your time to categorize a reporter’s list for each client. Even if your publicity firm specializes in a specific market, you will soon learn that certain media will become more familiar with an account or company. That can work in your favor. 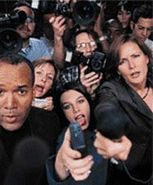 Knowing reporters, writers, or any media on that level can further a relationship with the press. These tips may seem common sense, and I hope that you are using them. But the reality is, as common sense goes, we tend to ignore these tips and soon become unknown with the press because of little things like keeping your database of reporters current. If you feel that your list may not be current, then contact a outside company, even another pr firm, to help with the launch of the publicity campaign. Then begin working on your list.